Are you sure your home is in sparkling clean condition? It is certainly not! Dirt, dust, cobwebs, germs, microbes and small animals have already set up base in your attic and crawl spaces. These are the most overlooked areas in your home, which make your house a potential region of health hazard. And that’s not all, these harmless looking living creatures can actually damage your property beyond repair. You need help right away. You need to contact Quartz Solutions and avail our free inspection package as soon as possible. We promise to search out these creepy crawly, clean the area, and prepare a plan for the upkeep, maintenance and upgrading of these dark nooks of your home. Attic and crawl spaces are neglected for years and years and with each passing day your home is exposed to potential health dangers and damage. Harmful and unhealthy gases can be very harmful for our health and may also trigger hazardous allergies. Neglected attic and crawl spaces can breed mold and mildew that weaken the basic structure of the home. They thrive in humid conditions and eat away into the woodwork and foundations. Wasps, yellow jackets, spiders, ants, roaches, flies and termites love to lurk in dark areas. These insects are one of the main causes of protozoan infections. 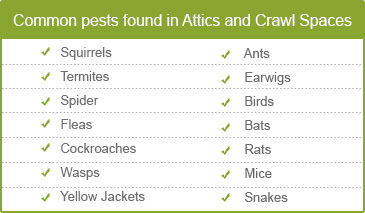 The attic and crawl space is also a home for rats, rodents, mice, squirrels, bats and other small animals. These animals eat away wiring and insulation, and disturb the temperature inside the homes. Now you have to get prepared for an inflated electricity bill. The dingy areas give off an unbearable stench because of their excreta and need to be cleaned at the earliest. A systematic and methodical proposal is what we are planning for inspecting your attic and crawl spaces. We, at Quartz Solutions, have skilled teams, who use state of art technology to provide you a free inspection of your home. You will now be able to get rid of the harmful Radon gas that may be lurking in the dark areas of your home. After setting an appropriate time with you, we will dispatch our skilled personnel to assess the troubled areas,while keeping your budget in mind.Then, we will formulate a cleaning plan. It’s not an easy job to earn money and we understand that there are limitations. Quartz Solutions provides customers value for money at inexpensive rates. All that you’ll need to do is let us take over the attic and crawl spaces of your home and apply our knowledge and cost efficient techniques wherever we can. Whether it is the Turtle Back Zoo or Thomas Edison National Historical Park, West Orange, Essex County, NJ (Zip code 07052) has a thriving community of almost 46,207 people. The area is home to many Hollywood TV stars, Broadway actors, jazz musicians, artists, comedians, and superstars. People in the area want to have clean and clear homes that they can retreat to every night, and for this they need to be in touch with Quartz Solutions at all times. 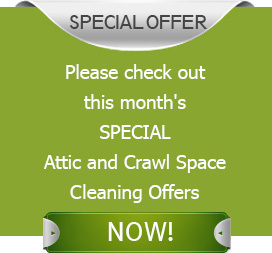 Quartz provide Attic and Crawl Space Cleaning Services in West Orange, Essex County,NJ (Zip code 07052), call us at 973-536-1013 promise to keep your home in perfect clean conditions for all times to come, so act now on our free inspection offer!